Yesterday I had the pleasure of watching Mike participate in the outstanding accomplishment of the 113th Boston Marathon to raise funds for the Leukemia and Lymphoma Foundation in the name of our dear friend Jon. Being a Bostonian I've always participated in the celebration surrounding Marathon Monday but have never seen it through the perspective of being so close to some one who has run it. From the months and months of training and ice packs, to the dropping Mike off on the Common to be bussed 26 miles out of the city and told to run back, the anticipation, the unity, the sense of community, and the pride in seeing him round Boylston Street to the finish line sporting his charity's colors is a feeling I know I can't transcribe here. 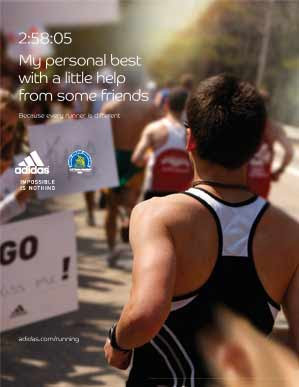 ...though, I couldnt help but notice, sponsor adidas did a pretty good job of isolating the pride of the individual runners accomplishments in their 2009 Boston Marathon ad campaign.